The MDT’s Mountain Training Scheme integrates training and assessment in both mountain walking and rock climbing. Training and assessment courses cover all levels of skill from basic mountain walking and rock climbing to the Mountaineering Instructor Award where the recipient is qualified to lead parties and instruct mountain-craft under all conditions in any of South Africa’s mountains. The programme, standards, course syllabi and certification is coordinated and controlled by the South African Mountaineering Development and Training Trust, which is a legally constituted body registered with the Master of the Supreme Court. Training and assessment courses are run by Service Providers approved and accredited by the Trust. Note: Candidates can enter the schemes at any level but the exit level requirements require that the candidate can demonstrate competency of all levels below. 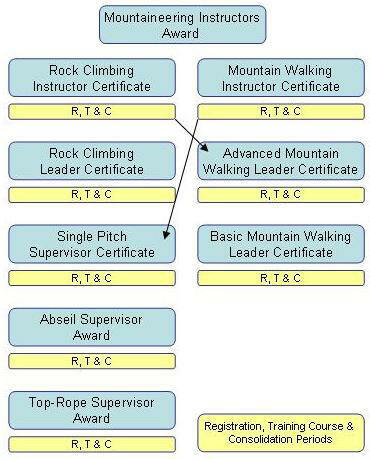 Rock Climbing Instructors must hold the Advanced Mountain Walking Leader Award, and, Mountain Walking Instructors must hold the Single Pitch Supervisor Award.